Metal Laminate vs. Aluminum Lobby Signs: Which Is Best for Chicago? When it comes to reception areas, for many Chicago business owners, the question is which is best, metal laminate vs. aluminum lobby signs? The metallic look is a favorite choice for many a Chicago area business. The advantage of this appearance cannot be overemphasized. For example, signs made of metal or aluminum evoke a sense of steadfastness and are very durable. This material enhances the look of a reception area offering a sleek appearance. And, metal signs add an air of sophistication to the atmosphere of the lobby. As a result, metal laminate lobby signs for Chicago businesses are becoming a much sought-after addition to reception areas in the city. Yet does it make sense to choose metal when there is the option to go with aluminum letter lobby signs? For Chicago entrepreneurs, this new choice is becoming a bit of a head-scratcher. What is the difference between metal laminate and aluminum lobby signs – and why should it matter to you? Thickness. If the depth of the letters matters to you, metal laminate has aluminum beat. Flat-cut aluminum may have a thickness of up to ½ inches. 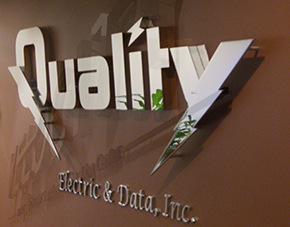 Metal laminate letters can be as thick as the substrate to which the laminate is mounted allows. Generally speaking, the thickness starts at ½ inches and goes up all the way to two inches. Color. Metal laminate may be nothing more than anodized aluminum that is painted to mimic gold, silver, brass or any other type of metal. In other cases, the metal letters are truly fashioned from the expensive metal materials. Metallic colors bring out the beauty of the material. On the other hand, aluminum letters can be enameled with a wide range of color choices to match your lobby’s interior design. Dramatic effect. When you have worked with an interior designer to create a reception area that has several dramatic style elements, a metal sign fits right in. Edges can be painted black to give your sign a vivid depth perception. That said, aluminum laminate also has a flair for the dramatic. With a polished, brushed or satin finish, the sign can highlight the interior décor style. The question here is simply whether you want your sign to fit in or stand out. While there are copious other material choices available, there is indeed something special about metal laminate and aluminum. Impossible to imitate with other materials, the metal can imbue your space with an atmosphere that is just right for the industry you represent. Getting started with this type of marker does not have to be complicated. Call the friendly signage professionals at Mark Your Space for a consultation. We will work with you on finding the right lobby sign style that uniquely suits your niche as well as your company. If you have never commissioned a lobby marker before, you are in good hands. For example you may want to create an entire different look and use wall graphics for your Chicago lobby sign. We will present you with a number of sketches to find out which one is closest to your vision of the perfect sign. From there, we discuss material choice and color options. Whether you like us to match the marker to swatches of wall color you bring or a certain material selection that you have in mind, the new sign will complement your reception area’s look and communicate the atmosphere that your company is so carefully cultivating.